When life gives you lemons, your first instinct may be to make lemonade, or perhaps to squeeze those lemons over your seafood dinner. Lemons are useful for more than these culinary pursuits, however. Yellow lemons can add a cheerful pop of color to your home or office decor and can make a striking table display at a party or reception. Lemons are inexpensive and can be found at any grocery store, making decorating with lemons a simple way to update your space. Lemons are an inexpensive way to add color to home or party decor. Place lemons in a glass vase or bowl for a simple but eye-catching display. Add interest with an unusual-looking bowl or vase. Lemons can be displayed dry, or try partially filling a vase with water and floating a lemon or two in it. For a table decoration that will only be displayed for a short time, cut lemons in half and place them in water in a glass vase or bowl. Cut lemons in half with a sharp knife and remove the pulp. Use the hollow lemon rinds as bowls to display small snacks like nuts or decorations like beads or pebbles. The lemon rinds can also be used as votive candle holders. 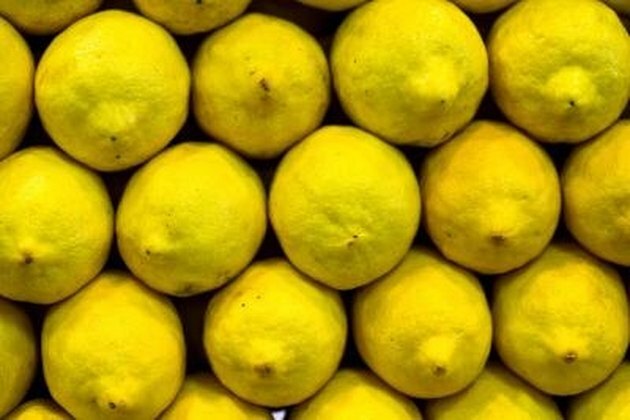 Slice lemons into thin rounds and bake them on cookie cooling racks in a 175-degree-Fahrenheit oven for five to six hours until they are dried. Use the dried slices to decorate wreaths of greenery or place them in bowls of potpourri. Label paper tags with names and hang the tags on lemon stems to create place cards. You can also cut the bottom off a lemon so that it sits flat and use a marker to write a name directly onto the lemon's peel. Purchase a potted lemon tree from a nursery and use it as a decoration in your home. With enough light, it is possible to grow lemons inside your home. Some dwarf lemon trees are intended to be grown in pots and can live for a long time indoors. Al Derr began writing professionally in 2010 and has published work in "Theatre Journal." She is a freelance writer, tutor and theater director. She holds a Bachelor of Arts in theater and secondary education from Texas Christian University and a Master of Arts in theater history from Texas State University, San Marcos. Is Lime Juice Used to Clean?